Last week I discussed how to decorate with personality using accessories. 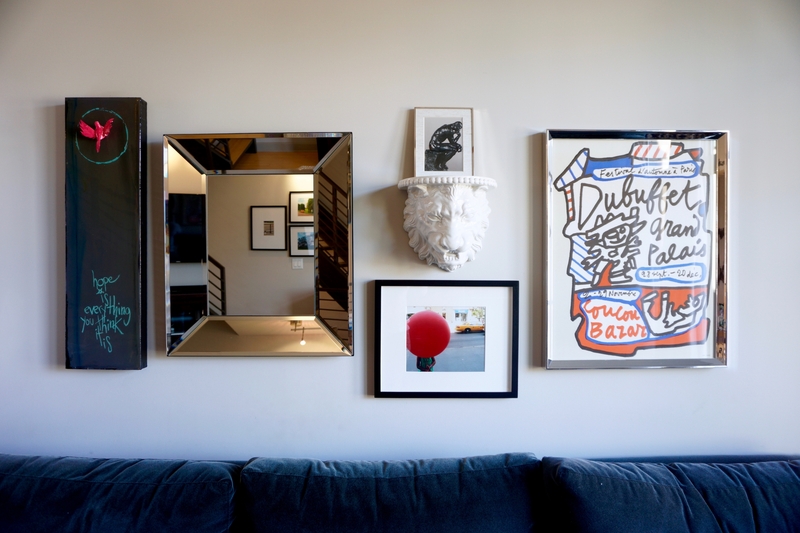 Another way to decorate with personality is to design an art gallery wall. It’s also a great way to make a big design impact, especially if you don’t have much wall space. Because my townhouse has floor to ceiling windows, I really only have two walls in my living area. One wall has the tv and a bookcase, leaving the other wall for my art gallery. Let me show you how I’ve designed art gallery walls. If you don’t know your decorating personality yet, these questions and quizzes will help you find it. Next, figure out what to hang on your gallery wall. 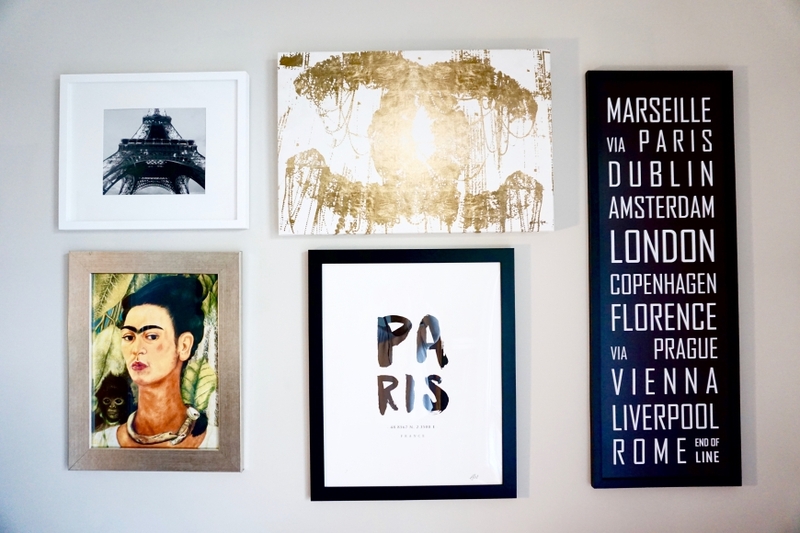 An easy formula for an eclectic art gallery wall is to include more than just original art, but also photographs, prints and something unexpected. Play with scale. Include very small pieces as well as very big ones. Incorporating something 3-D adds interest and dimension. A mirror is also a great way to break up space as well as reflect light. Think high/low design – original art next to a print is just fine. You will be amazed how the right frame can elevate a print to a real work of art. The above photo is the art gallery wall in my living room. The wooden art is an original piece that I bought at an art show; I like the pink bird and also the message. The mirror is from Pottery Barn. I wanted to balance the framed print on the end so I looked for a mirror of roughly the same size. The photograph is mine; it is both artsy and a reminder of a particularly special day in Manhattan. While there is not one unifying color on this art gallery wall, the colors are repeated and therefore the entire wall feels cohesive. The lion head is from an antique shop. It’s interesting and unexpected. I thought it needed something on top so I framed a postcard that I bought at Museé Rodin in Paris. At Christmastime I switch that out for a festive Christmas decoration. Both the lion head and the postcard make me happy; lions are my favorite animal and the post card reminds me of the Rodin garden, one of my favorite places in Paris. Your decor should make you happy! The framed print is from a flea market in Paris. I love all things French and I was proud of myself for negotiating a good price while speaking very limited French. While the print was very inexpensive, I splurged on professional framing. I think it looks rather glamorous with the beveled frame and it also echos the design of the mirror. I also have an art gallery wall in my office. This wall is much smaller than in the living room, but I still wanted to make a big impact. Since this is my space alone I wanted it to be a true reflection of my personality, interests and tastes so I really had fun designing this wall. I took the photograph of the Eiffel Tower in Paris and made a print in black and white. The print of Frida Khalo, one of my favorite artists, is from Art.com. It was only $30 and the frame is from the discount section at Sam Flax for another $30. The subway sign is interesting; it’s long and the subway typeface is a nice contrast to organic forms in the other art. I bought it on Etsy for about $60 and the frame is a very inexpensive wooden poster frame from Sam Flax. 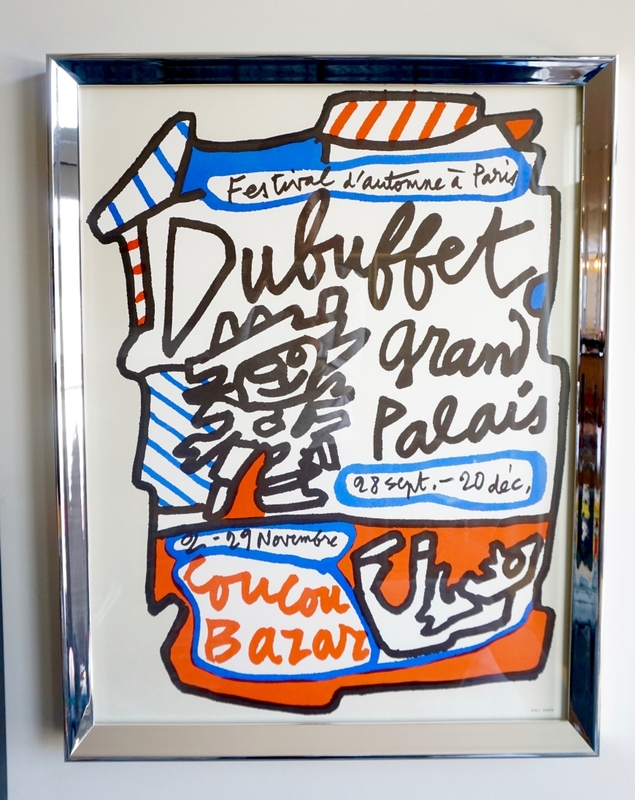 The Paris print is a numbered and signed limited edition. I bought that on Curioos. It’s modern, but slightly quirky – it has the coordinates of Paris beneath the brushed letters. My biggest splurge on this art gallery wall is the canvas from Oliver Gal. In fact I created the whole wall around this one piece. I love that the iconic Chanel symbol is messy and irreverent, but painted in glamorous gold. The colors in the Frida Khalo print breaks up the black and white of the other pieces, but also incorporates some gold from the Oliver Gal canvas. I wanted to keep the colors on this art gallery wall more closely tied together because it’s displayed over a pink daybed. Your art does not have to be perfectly symmetrical, but it should be balanced. As you can see, my art gallery walls have different size art pieces, but there is still a feel of balance and your eye travels easily across the wall. The long subway sign on the right is balanced by the photograph and print on the left. Another key to creating balance is to be mindful of not just the physical weight of an art piece, but the visual weight as well. Dark frames are going to feel heavy, even if they are made of a light material. Try to balance light and airy against dark and heavy. The best way to figure out the placement of art is to lay it on the ground and move pieces around until it feels right. Take a photo with your phone and then move the pieces around again. Continue this process until you have found the best combination. An gallery wall doesn’t have to be reserved just for art. 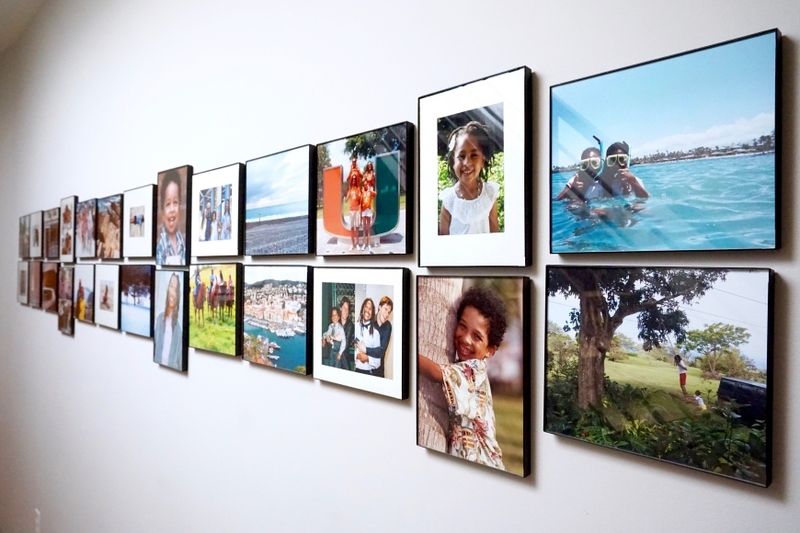 Photographs of family and friends can make a great art gallery wall if they are displayed in an artistic way, instead of haphazardly and randomly. We all know an aunt or grandparent’s wall-papered stairway full of family photos in wooden frames, metal frames, big, little, oval or square that are nailed to the wall without any artistic regard. The easiest way to display personal photos in an artistic way is by using the same frame and printing the photos the same size. I have photos of my children as babies next to photographs taken last year but my gallery looks artistic and cohesive. I enlarge the photos to 8×10 and I buy the simple black frames from – wait for it – the drugstore. The frame is about $5. If I have a smaller photo that can not be enlarged I use an 8×10 mat. My family photos are hung in a hallway and it really looks like an art gallery. 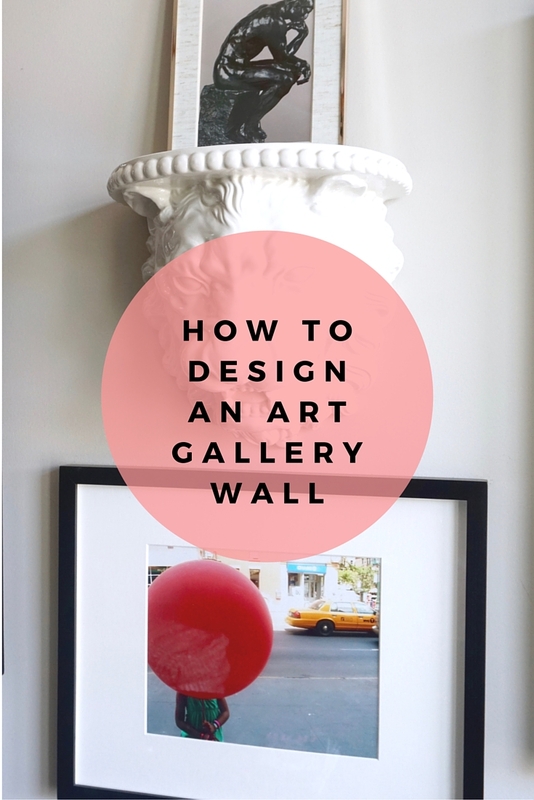 I’ve given you three examples to show how easy it is to design an art gallery wall – now it’s your turn. Leave a comment if you have any questions and if you want even more design and decor inspiration, check out my Pinterest boards. P.S. You may also like to read another blog post about design and decor How To Decorate With Personality.